This page lets you configure how IP addresses are assigned to the Intelligent Platform Management Interface (IPMI) cards in the cluster nodes. IPMI is used for remote access to a node, and can be used to troubleshoot malfunctioning FXT nodes. Avere recommends configuring IPMI on all cluster nodes so that they can be accessed in the event of a node failure. This page defines the cluster-wide IPMI configuration, which is automatically applied to all existing cluster nodes as soon as the configuration is saved. 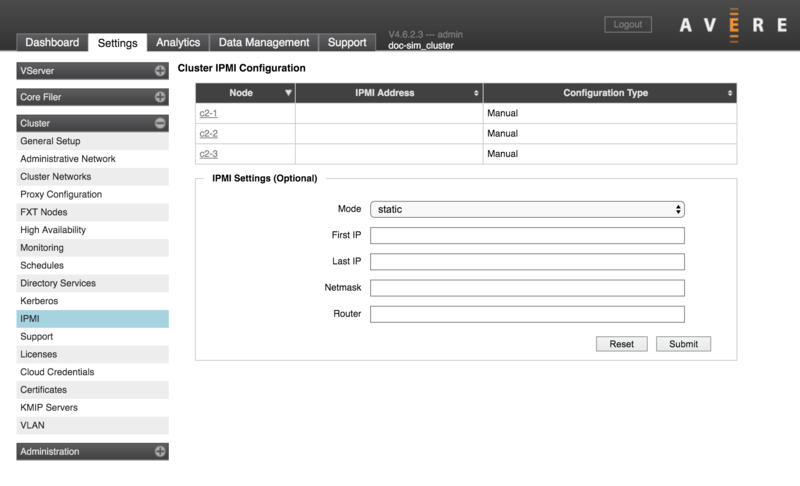 When a new node joins the cluster, it automatically takes on these IPMI settings. Does not change the IPMI setting. IPMI cards typically are configured to use DHCP when shipped from Avere. If choosing this setting, make sure that the card still has a valid configuration - if an IPMI card does not have an IP address it cannot be used for system recovery. IP address range - specify a contiguous address range by entering the first and last IP address in the range. Use DHCP to assign the IPMI card’s address. The top of the page lists the nodes in the cluster. Clicking on a node name loads the Node Details page, which includes options for setting a custom IPMI configuration for an individual node. Read Custom IPMI Configuration to learn more.